Portraits of YouTube star Justine Ezarik (a.k.a. 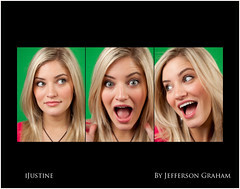 iJustine) by Jefferson Graham, Santa Monica, California. iJustine produces regular videos for YouTube about Internet sensations like Facebook, Twitter and MySpace. Early morning at the Netflix distribution facility in Fremont, California, to watch nearly 200,000 envelopes get ripped open, DVDs get shuffled, and then re-sent out by the end of the day. We go to the San Francisco headquarters of Twitter to ask what they’re doing.